Looking for a quick crochet project? This free crochet washcloth pattern is just what you need! Use up some of your pretty yarn stash and make a bundle of them in no time at all. 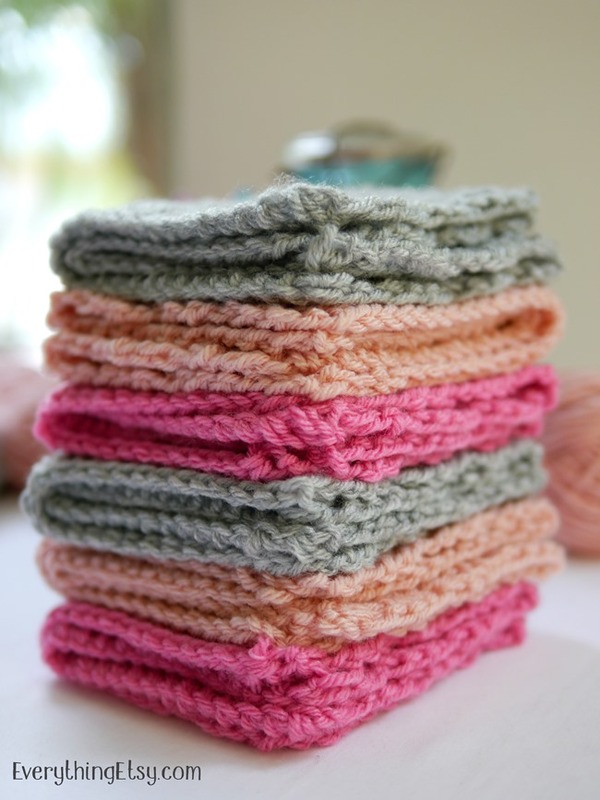 This project is perfect for beginners, but everyone can use a simply sweet washcloth or two. 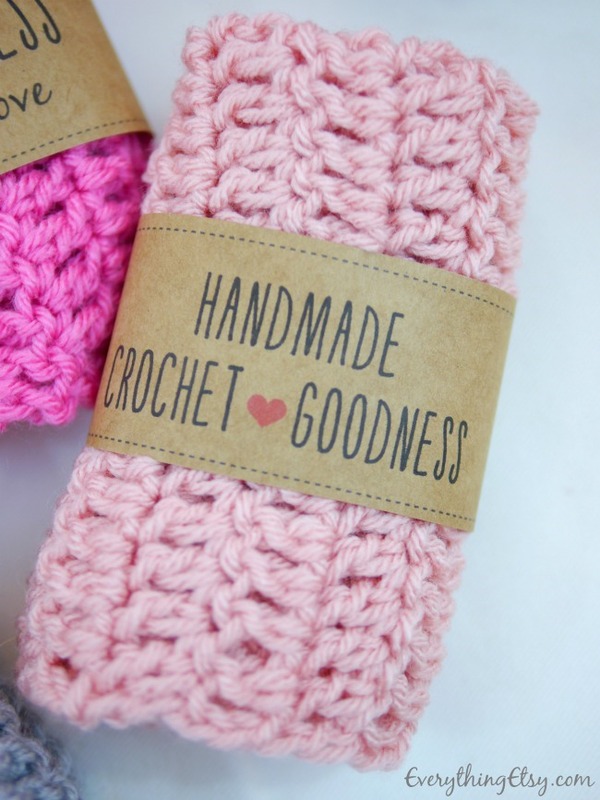 Follow along with my crochet pattern and you’ll have an awesome handmade gift in minutes! 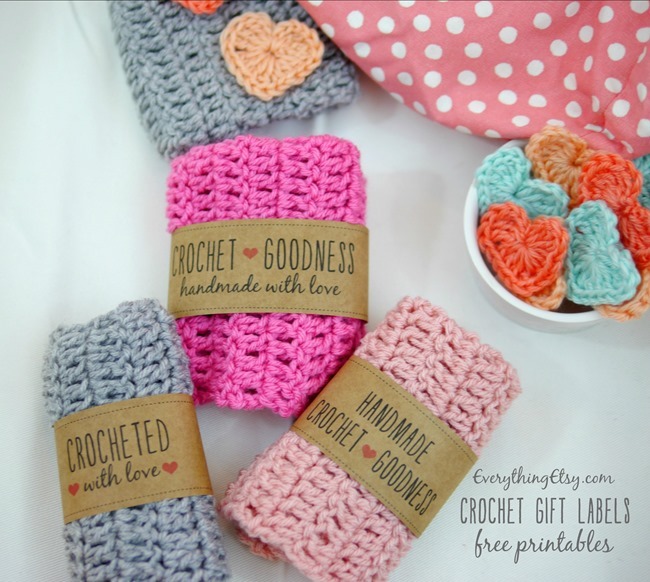 Once you’re done making a bunch you can wrap them up in these crochet gift labels I created! 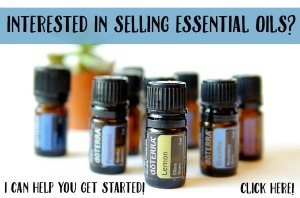 Get your free printable labels right here. They’re a simple way to add a little extra love to your handmade gift. I used Lion Brand Yarn – Vanna’s Choice and Vanna’s Choice Baby. You’ll need a J size crochet hook to have them measure the same size as mine. These are a 10 inch square for a nice oversized luxury washcloth. 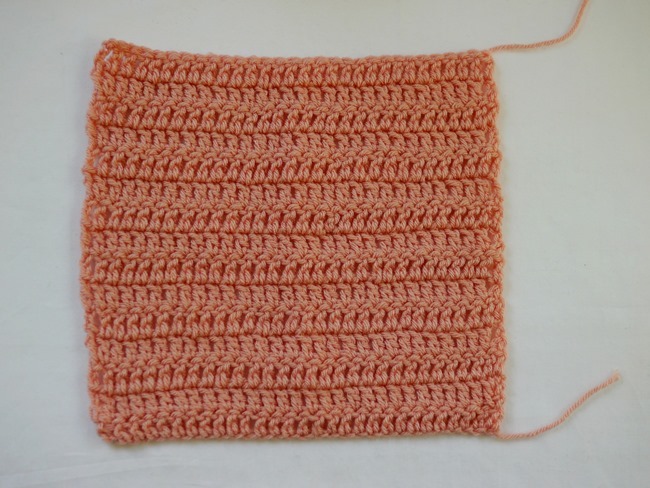 Row 1 – Double crochet in the 2nd stitch from the hook and then continue to double crochet 30 to complete the row. Row 2 – Turn and chain two. Double crochet 30 to complete the row. Continue until you reach 15 rows total. It should be a square. Finish off your last stitch and weave in the extra yarn. Pair a washcloth and handmade soap together for a sweet gift! You can find tons of free crochet patterns in our past posts right here. What kind of small crochet projects do you like to do? I’d love to hear about them. I’ll be teaching a crochet class at the upcoming Snap Conference and I’m thinking up easy projects to share. I just bought crocheted washcloths this past fall at a craft show for the first time. I didn’t think I’d like them as much as I do! This is great…thank you! I am a beginner of sorts. Still not happy with the tension variation with any project. to be so concerned about. Thanks for the washcloth pattern. I did a spa cloth, single crochet stitches, half double crochet, double, and then back to single. I too am not happy with tension in mine. I have to keep practicing too. I can’t start a CtoC yet because I am afraid tension will be way off. I have been practicing off and on for nine months. Do acrylic yarns work well as washcloths? I have always read that 100% cotton should only be used. Thanks! I have to agree about the cotton yarn for washcloths. It absorbs better than acrylic yarn. I went to Wal-Mart and got the small one of different colors of cotton yarn. You will like it better.one ball make two wash cloths. If you use this pattern. You can go on YouTube and find more free patterns. And they also teach you to. Good luck. I teach to. Seem after cotton yarn losses it shape after washing ,what do I do? The picture in my email has a circular face cloth pattern but the directions are for a square dish cloth, disappointing. I was really excited about the round design. Did I miss something? 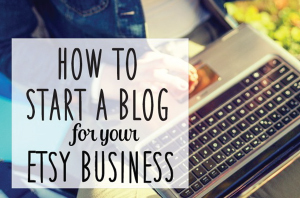 You must have just clicked on a link somewhere in the post to my last washcloth tutorial. If you scroll down the post you’ll find the directions right there on that page. 🙂 Have fun! Nice washcloths, very pretty. Did you use 100% cotton yarn? If not how absorvent it is? 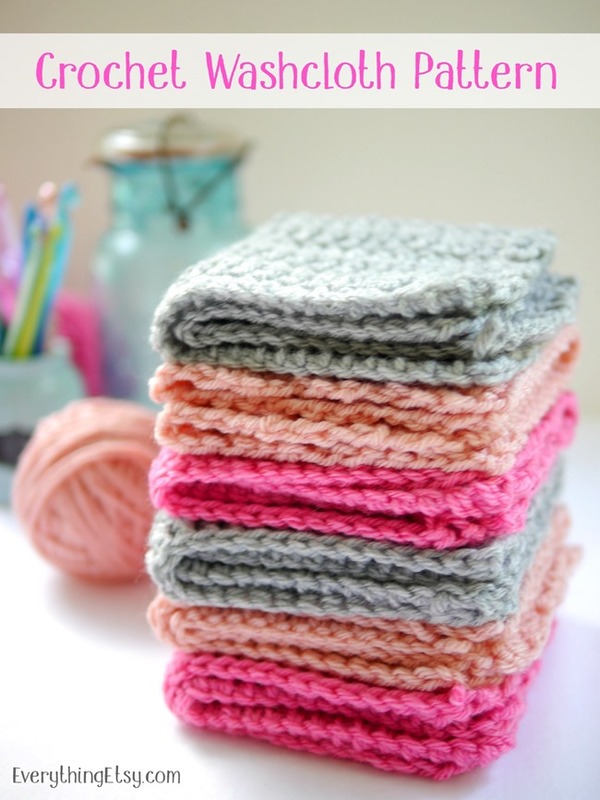 I have made washcloths as stash-busters from both cotton and acrylic yarn. Cotton is soft and absorbent, so it’s the better choice for bath and face cloths, and most definitely for baby cloths. 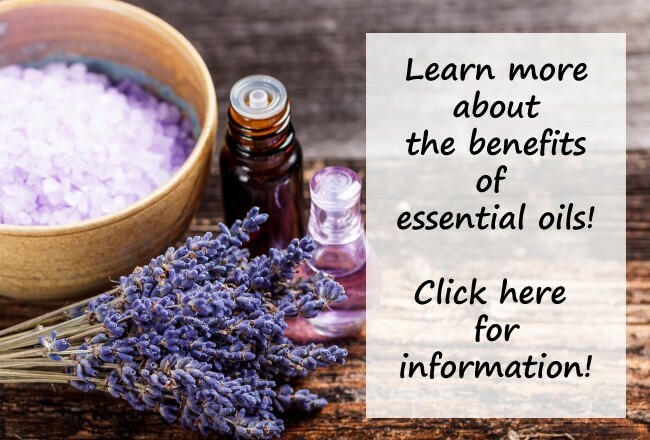 Cotton is best for personal use, especially if you like using face pads to remove makeup, etc. Cotton is also very good for general dish-washing. You can use acrylic for ‘scrubber’ cloths for dishes and counters, or for general house cleaning. Acrylic, particularly Red Heart, wears like iron– it will last a long time! Acrylic washcloths aren’t as absorbent, and you will want to wring them out well before wiping surfaces, as they do drip more than cotton. But the acrylic has a more abrasive texture so it’s great for cleaning counters, tubs, etc without scratching. I don’t recommend either yarn for really tough jobs like heavy burnt-on food– those do better with a real scrubber, like an SOS Pad or something much more abrasive. But you can certainly use acrylic with a mildly abrasive cleaner such as Bon Ami or even baking soda for tougher jobs like stubborn bathtub rings. A cleaner with bleach in it like Comet might weaken the yarn or affect the color, but they do work fairly well. Use your cute crochet acrylic cloth for wet cleaning, then follow with a soft dry cloth like terry or something similar to dry and shine your nice clean surface. The nice stitch texture of a crochet cloth is so easy to keep fresh, too. Some people complain about the “stink” whether it be cotton or acrylic, but that’s easily avoided if you rinse your cloths out well after use and hang them to dry– don’t leave them wadded up or folded over the sink to dry. I usually just rinse mine out in soapy water after use, then rinse with fresh water and squeeze them out before hanging on my line to dry in the fresh air after I finish dishes. I find that I get several days out of a dishcloth under ordinary use (not really NASTY stuff, just things like washing sandwich plates, soup bowls, silverware, drinking glasses… stuff that’s not really caked with smelly or sticky food like melted cheese– ask how I know this!) before it really needs laundering. Then when they are ready for the laundry, I just toss them in like any other washcloth. I wash my housecleaning cloths after each day of use… even just a good hand-washing with detergent, a thorough rinse and a good sunny clothesline on a nice breezy day is fine for the house cloths if I don’t have a full wash load for the machine.